Faites Tomber Le Masque ! Dirigé par Lucien Guignard, ce workshop de 2 jours met les techniques pour acteurs professionnels au service de chacun. 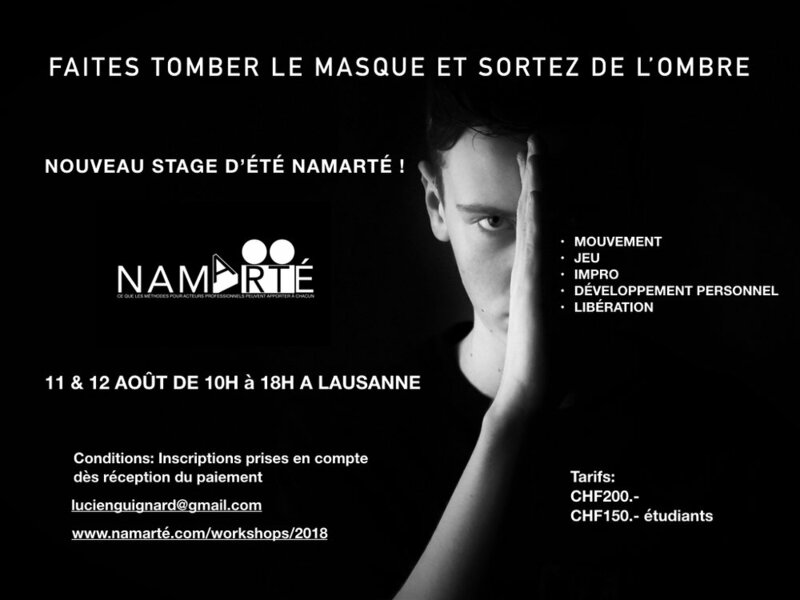 This workshop is designed for english people living in Switzerland who wish to follow theatre classes in their own language. A perfect set-up for developing one's communication skills, centering one's voice and energy, exploring the way one gets what he wants – using verbal on non-verbal communication means – and for having a go at embodying characters that are different from oneself. The workshop – using a set of exercises designed for professional actors – is fun and dynamic & constitutes a safe environment for self-opening and letting go of any blocks holding one back in his/her everyday life. A focus is maintained on enthusiasm, wellness, centering and alignment – using core muscles strengthening, yoga, and other breathing exercises. One can easily have a go at developing his/her skills in french language through little scenes or exercises. Having trained and worked in Soho, London for three years, Lucien Guignard is looking forward to share with you the joy of acting in English. Join in by sending an e-mail at lucienguignard@gmail.com or visit Book Now section to check the prices and send an application form. Venez parfaire votre technique ou découvrir le monde de l'acting et de l'imagination ! Samedi 11 et Dimanche 12 Février de 10h à 18h au centre ville.